The Rotary clubs of Dorking, Dorking Deepdene and Ashtead announce their sponsorship of Mole Valley Girls Football Club. The launch of the Sponsorship took place at the new Medowbank Stadium in Dorking on Sunday 27th January when the over 18s Girls Team were playing a match against Wandgas. The Rotary clubs of Dorking, Dorking Deepdene and Ashtead are delighted to announce their sponsorship of Mole Valley Girls Football Club, under the banner of ‘Mole Valley Rotary’. The deal will provide £1,500 for each of this season and next, with a possibility of continuing into the future. In return, the Football Club will carry the Official Rotary Logo on the shirt sleeves of each team, and on other items of kit, and both sides will promote their events and functions to the other, to stimulate joint synergies. In Mole Valley our aim in working with the Mole Valley Girls Football Club is to bring these opportunities very close to home, and also to reach out to their parents to get involved and help us help others. 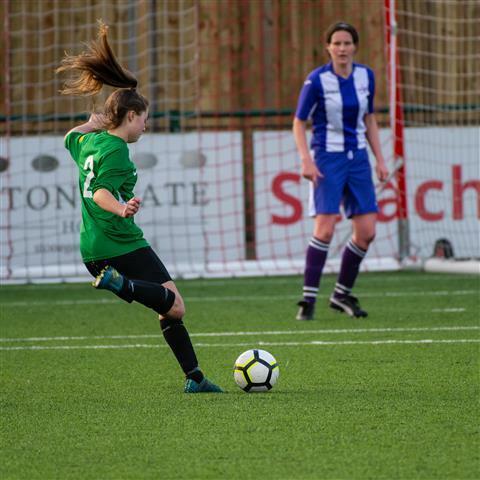 Mole Valley Girls FC is a girls-only football club, catering for girls of all abilities from age 7 upwards, with teams competing in the Surrey County Women and Girls League at U10 to U18 level, … and now with an over 18 Ladies team. Girls football is one of the fastest growing sports in the UK. The aim of MVGFC is to further grow participation, making football available to all girls within the area. As well as promoting participation, they aim to develop players to achieve as much as possible, both individually and with their teams, and also to provide an enriching environment where the girls socialise off the pitch. Rotary has provided a promotional sail, a banner for external use and a smaller version for internal use. All funded by the clubs with a grant from the District Membership Development fund.